As you probably already know, Tom Wood is the masterful artist behind the Into The Echoside game, the Oracle of the Three Rings expansion pack, and many of the Psychopathic t-shirts that you may already have in your closet. His most recent Psychopathic contributions are his rendition of Fearless Fred Fury, and the Hallowicked collection. Recently, he has expanded his portfolio of art in which you can have delivered straight to your doorstep on high quality stretched canvas! I’m telling you ninjas…I’ve got 3 of these on my wall already, and I can’t wait to add more to my collection! 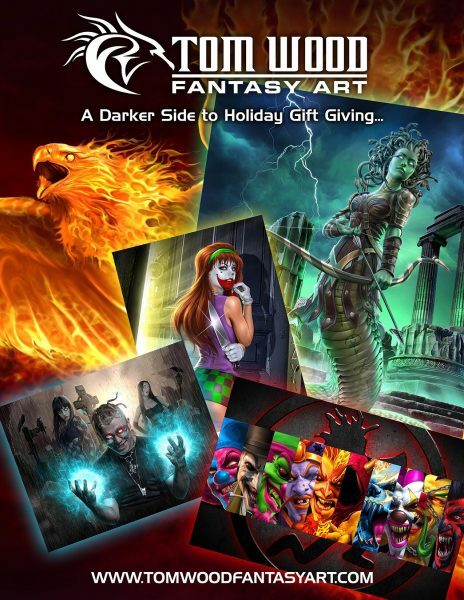 To see all of your options for the ICP / Psychopathic collection, hit up https://tomwoodfantasyart.com/collections/icp-art! Click the pic to Get Tom Wooded!